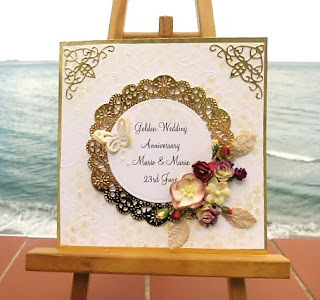 Hi Sylvie, this is a lovely elegant Golden Wedding card and I love the flowers you've added. The recipient is going to love it. One day I will be caught up with myself (I hope) LOL!!! Loved your baby card from earlier and this golden wedding is amazing. Love the sequin waste treatment. Brilliant finished result. Sylvie you card once again is amazing. The gold doily is perfect and flowers are gorgeous. Well done! This is so intricate and beautiful, Silvie! Your craftsmanship is superb!Thanks SO much for playing with us at CAS-ual Fridays!